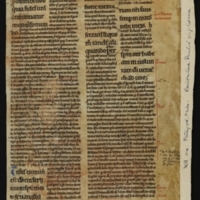 2 columns, each split in two at various points to include the letter text and commentary side by side, plus space for commentary (at the right on the recto and the left on the verso). Rubricated. 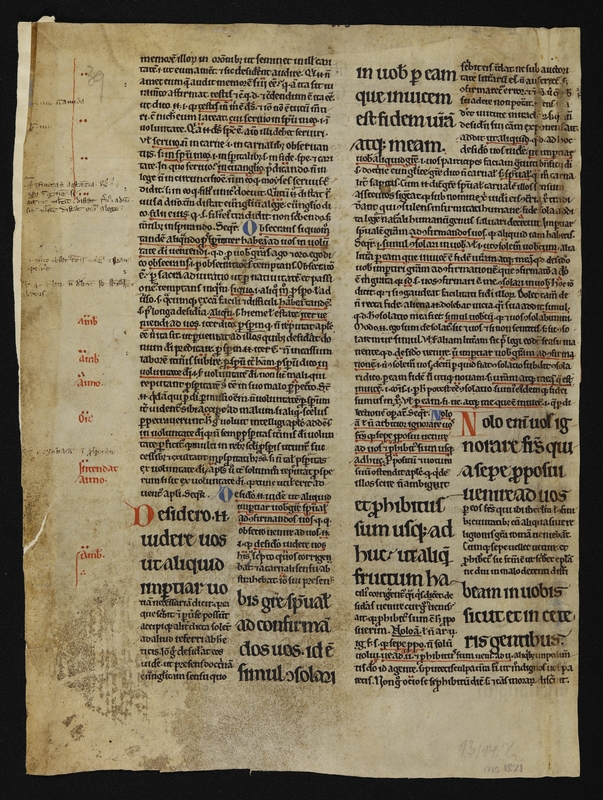 Text area (recto): 225mm x 210mm (verso): 235mm x 210mm. Number of lines (recto): 53 (verso): 52. Line height: 50mm. 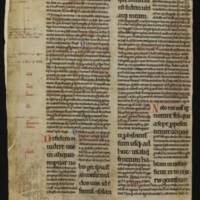 Width of columns: recto 82mm verso, left 75mm right 85mm. Ruled in lead. No page numbering. First line recto: (letter) meo per iesum christum (commentary) bona a deo data esse et. Last line recto: (commentary only) intermissione vel facio memoriam uestri sine intermissione hoc ideo dicit apostolus scilicet se esse. 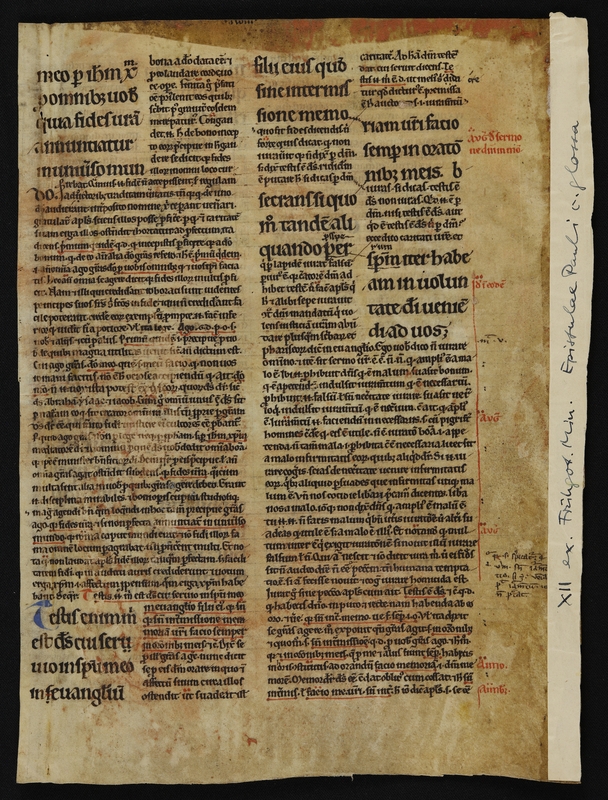 First Line verso: (commentary only) memorem illorum orationibus ut seminet in illis cari-. Last Line Recto: (commentary only) retis. Non ergo ociose se prohibitum dicit sed et causas morarum discernuit. Publications: Petri Longobardi, Magistri Sententiarum, Parisiens. Quondam Episcopi, in omnes D. Pauli Apost, Epistolas Collectanea. Paris: Jehan Petit, 1538, https://books.google.com.au/books?id=hxroZs5eCCwC; Patrologia Latina, vol. 191, 1880, cols. 1317-1321. Have Rosenthal's notes ('Manuscripts from the Collection of Professor Bernhard Bischoff', p. 2 no. 6). Physical Size: 1 page double sided vellum (280mm x 210mm) with a thin strip of paper (281mm x 16mm) glued to the right hand side of the recto containing a handwritten note in ink "XII ex Frûhgot. Epistolae Pauli c. glossa." A glue stain at the top of the recto suggested that another piece of paper was glued to it at some point.